Happy Friday, KW!! We’re super excited and from the title of this blog, it’s safe to assume you already know why. That’s right, CIRCA 1877 is now SOLD OUT!!! Before the inception of CIRCA, we spent months analyzing your wish lists, researching the market, and working to fine tune every aspect of your ideal building. For that reason alone, we would like to thank you. Our true urban dwellers and investors have been major contributors to the success of Uptown Waterloo’s newest condominium! CIRCA sold out faster than any other condo development in the history of Waterloo Region’s real estate market - with 90% of the units being purchased by local owners! Investing in our city and supporting local has always been important to us, and we love knowing that it’s important to you as well. Over the past few months, many strategies and ideas were brought to the table. As those ideas have come to fruition, there are many creative minds that we’d also like to acknowledge and express our gratitude towards. From our amazing sales team and design department here at Condo Culture, to HIP Developments and Him & Her for their creativity and vision - we sincerely thank you! Without everyone’s constant support and immeasurable work ethic, this project would not have rolled out as smoothly as it did. In our September blog, we had shared a few of our favourite things about the project. We want to give you a quick refresher on why this building truly is Waterloo’s most extraordinary condominium! Prime location! This building is right up the street from our Condo Culture Waterloo location in the Bauer District. It is steps away from all the amazing shops, cafes and restaurants in Uptown Waterloo and it is situated immediately between the brand new North & Southbound LRT lines. Its location remains one of the most walkable in the Region and with the new LRT system, it’ll be even more connected. 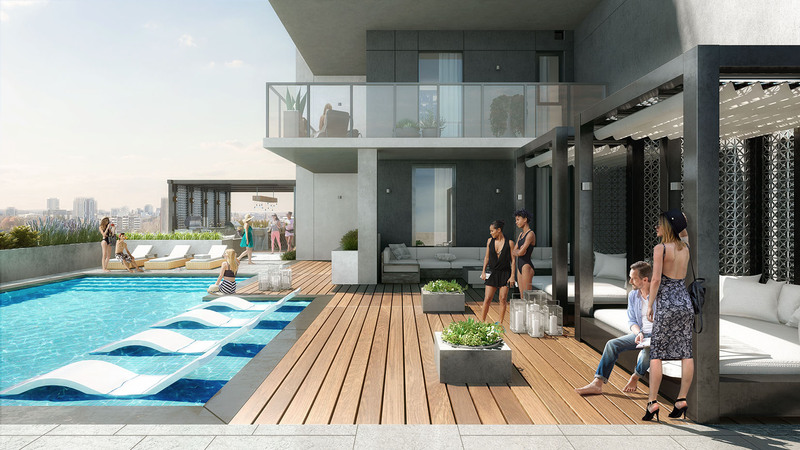 Rooftop Pool and Poolside Cabanas! It is worth noting that this is the first condo building in Waterloo to have a pool in over 25 years! On-site Restaurant featuring in-suite or poolside food and beverage service. Condo Fees that are on par or less than many of the other comparable local buildings. This is especially noteworthy given the wide array of on-site amenities at the building. Stunning Architecture that integrates the historic brick & beam building that housed former Brick Brewery with the modern glass condo building above. Pretty amazing, right? As you can see, we thrive on innovation and modernization. To have set the bar for the Waterloo Region by selling 188 units in 2 days (that feels so good to say that!) is a humbling and awesome experience. We cannot wait to see what’s next for Kitchener-Waterloo! Thank you for your continued support. We’re so proud to be a part of this growing community. Have a wonderful weekend!